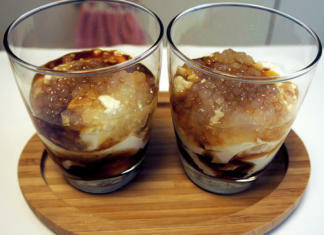 When the air gets cold and the season turns darker, you can turn one corner and you’ll find this Filipino favorite. It is common to find it near churches when after the evening masses, people flock to an old lady selling it. You can smell the aroma far away because they use charcoal to cook it. 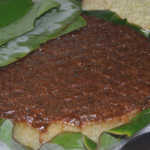 It is wrapped in banana leaves and smothered with butter so you’ll know by the smell that you’re in for a treat. From generations to generations, this delicacy has brought warm smiles to a lot of kids, mothers, and grandmas. This sweet cake is called Bibingka. 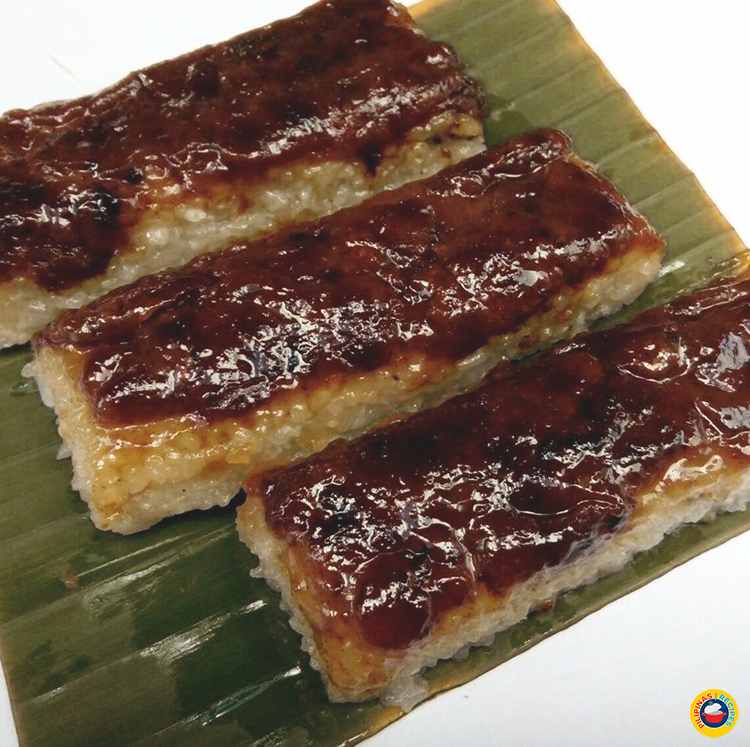 Now, you can also make this Bibingka Malagkit Recipe in the comfort of your homes. Glutinous Rice which is abundant in the country is used as the foundation of this native sweet while salted eggs are used as toppings. 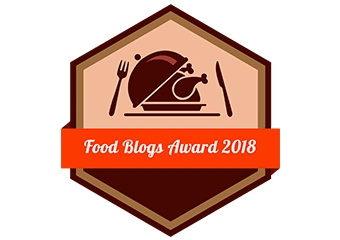 Nowadays, you will see people adding all sorts of stuff to the mix like topping it with Queso de Bola and Ham and Chocolate. While there are some restaurants including it in their menu all year round and even church vendors continuing to sell it on a regular basis, cooking this Bibingka Malagkit Recipe for your friends and family is still more special plus you get to control the proportions of the ingredients and you’re also sure it’s clean. 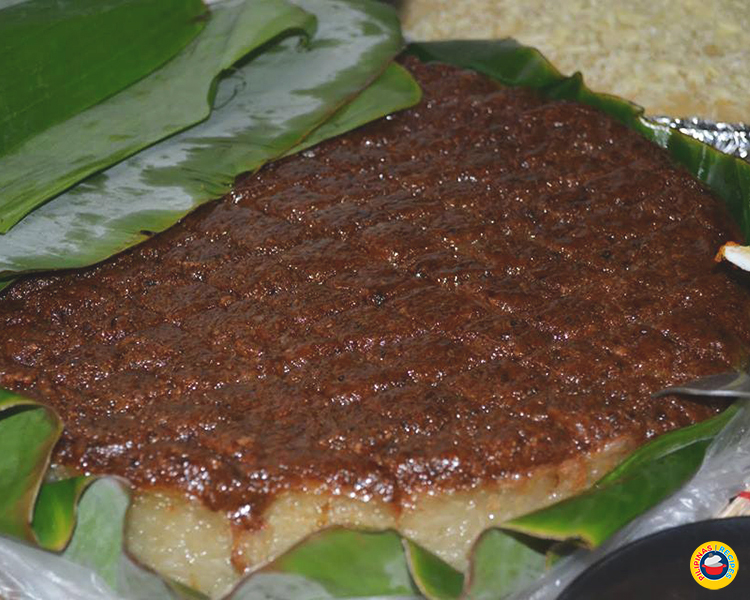 It is wrapped in banana leaves and smothered with butter so you’ll know by the smell that you’re in for a treat. From generations to generations, this delicacy has brought warm smiles to a lot of kids, mothers, and grandmas. 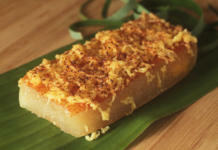 This sweet cake is called Bibingka. In a pot combine glutinous rice and 6 cups of coconut milk and bring to a boil then reduce heat to low. Simmer gently while occasionally mixing to cook them evenly and not burn the bottom, let the mixture thicken until it’s nearly dried out. Add sugar and salt then mix continuously on medium-low heat for 10 minutes. At this stage, it will be really sticky. Line a 9x 13 baking tray with banana leaf then transfer the cooked glutinous rice. Set it aside. Prepare your topping by mixing all topping ingredients together in a pan, bring it to a boil and simmer on medium heat uncovered until heavily reduced but still runny. Pour topping over the rice cake on the baking pan then bake in a 180C preheated oven for 20 minutes or until topping becomes really thick and dark (not burnt). Remove from oven and set it aside to cool down. 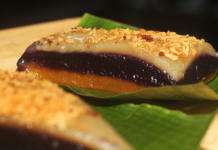 This video shows another way of preparing bibingkang malagkit. Another thing about this delicacy is the smoky flavor; since charcoal is used to cook it, it gives a wonderful flavor to the sweetness of the rice cake. 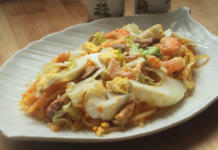 This Bibingkang Malagkit Recipe is certainly one of the many Filipino favorites that you should be cooking at home now. Don’t miss the chance of preparing this native sweet for your loved ones and even new friends when they visit you to show the Filipino in you. Serve this in the afternoon together with tea or Tablea Chocolate and don’t forget to garnish it with shredded coconut and some sugar. What if I don’t have banana leaves? You don’t have to. It’s ok. I don’t usually use banana leaves. Omigod, I have GOT to make this! You say it is smothered in butter and has a distinctive smoky flavour from the charcoal used to cook it, but I don’t see butter or charcoal listed in the recipe? ITs in the oven now!!!!! Cant wait to satisfy my cravings! What if i dont have oven. Is there any other way to get the same texture as yours aside from using charcoal? Can this be made in advance, like a day before?